Last night a fire broke out at the offices of the New Israel Fund supported, ultra leftwing NGO B’Tselem. Immediately their left wing choir went off into hysterical speculation about arson and other foul play. Sane people refused to speculate. This morning, pretty quickly, the fire services have declared the fire to have been caused by faulty electrical wiring. No sign of deliberate arson. We thank you all for your kindness, and promise to get back to work, and carry on until the end of the occupation. B’Tselem is one of a number of human rights organizations that are the subject of intense scrutiny and criticism after Channel 2 reported last week that a far-left activist boasted about how he helps Palestinian security forces find Palestinians who sell land to Jews. The Israel Police have opened a criminal investigation against Ezra Nawi, who was shown on hidden camera footage aired by Channel 2’s “Uvda” bragging about how the Palestinian land owners are tortured and later killed after taken into custody by the Palestinian Authority’s Preventative Security Service. We hope the fire didn’t destroy too much of the evidence the police will be looking into relating to B’Tselem’s person assisting in the executions of Palestinians for selling land. So against all this, New Israel Fund sent out the following mail shot and posting on their Facebook page. We know they regret this, obviously, because it went live on Facebook at 7am EST and was pulled down after 40 minutes. Obviously they have to get in a panicked attack on NGO Monitor who’ve been so effective at exposing what they really spend their donors’ money on. The offices of B’Tselem, Israel’s leading human rights group, were burned down in Jerusalem tonight. One person, who was not a B’Tselem staff member, was evacuated from another floor in the building with light injuries from smoke inhalation. Police are still investigating, but arson seems to be the likely cause. We’ve been in close touch with B’Tselem’s leadership. True to their character, they have repeatedly told us that they will not allow this incident to deter them from their work exposing the realities of the occupation. 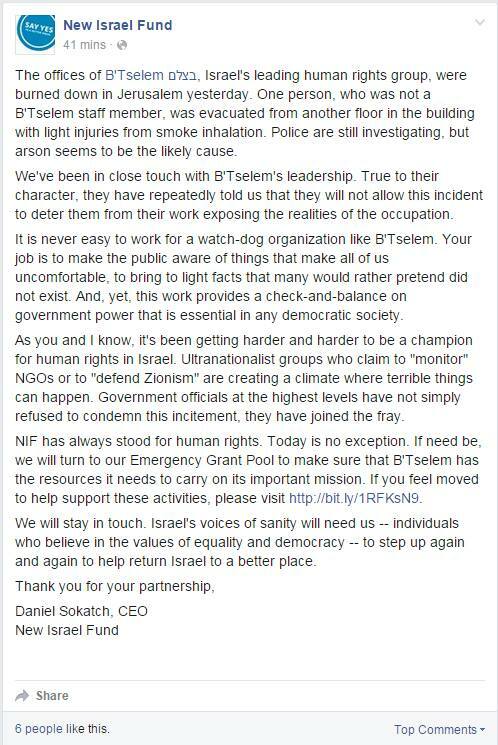 It is never easy to work for a watch-dog organization like B’Tselem. Your job is to make the public aware of things that make all of us uncomfortable, to bring to light facts that many would rather pretend did not exist. And, yet, this work provides a check-and-balance on government power that is essential in any democratic society. As you and I know, it’s been getting harder and harder to be a champion for human rights in Israel. Ultranationalist groups who claim to “monitor” NGOs or to “defend Zionism” are creating a climate where terrible things can happen. Government officials at the highest levels have not simply refused to condemn this incitement, they have joined the fray. NIF has always stood for human rights. Today is no exception. If need be, we will turn to our Emergency Grant Pool to make sure that B’Tselem has the resources it needs to carry on its important mission. If you feel moved to help support these activities, please click here. We will stay in touch. 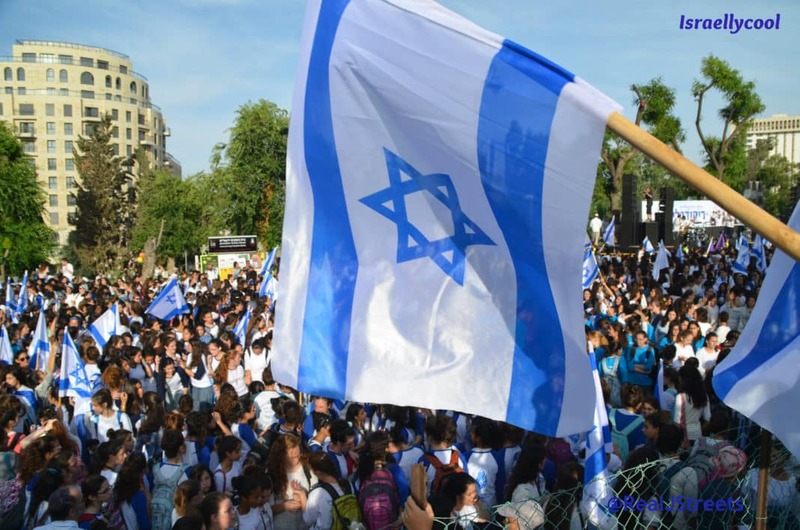 Israel’s voices of sanity will need us — individuals who believe in the values of equality and democracy — to step up again and again to help return Israel to a better place. As ever this is signed by the controversial CEO, Daniel Sokatch. Remember, New Israel Fund funnels many millions of dollars into groups like B’Tselem and Breaking the Silence who exist to destroy Jewish Israel. And they collect this money largely from gullible Jews who don’t have a clue what it is to live with Arab terror.